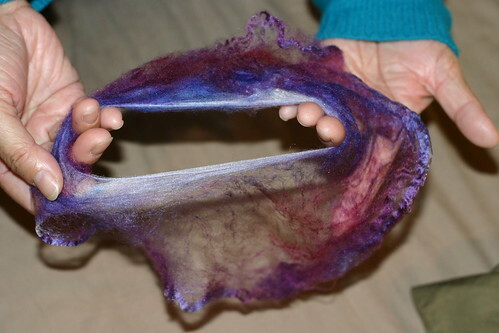 New stash, and spinning silk hankies! I went to SnB Newington this evening and had a lovely time, but the highlight was getting my hands on this! 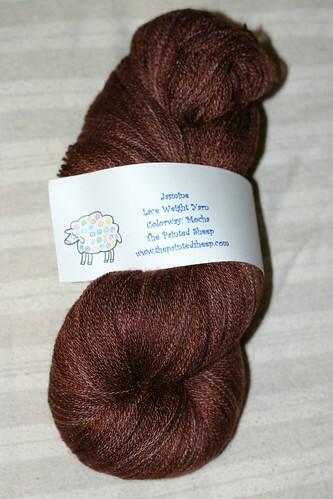 It’s lusciously soft and shiny laceweight merino/silk, hand-dyed by Kris of The Painted Sheep. The subtle color variations are just gorgeous. I think anyone who looks at my wardrobe or my Ravelry stash can guess that brown is my favorite color. As Kelly was able to quote from my Ravelry profile the second time we met, brown is my basic “black!” My hair is very dark but not quite black, so brown shades complement me much better. After my holiday gift knitting is done (which will probably be late January), this will become a lace shawl for me me me! I haven’t decided which one yet, but there are plenty of beautiful patterns for 1250 yards out there. 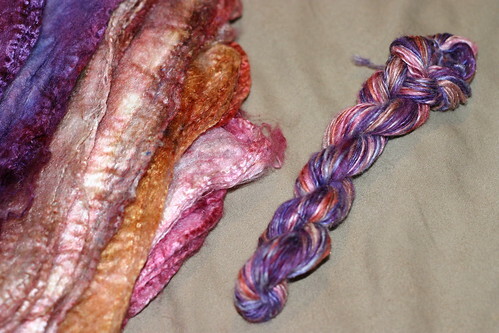 Since I had never spun these before, I used an article on spinning silk hankies from knitty.com for reference. We started out by separating off a single hankie. 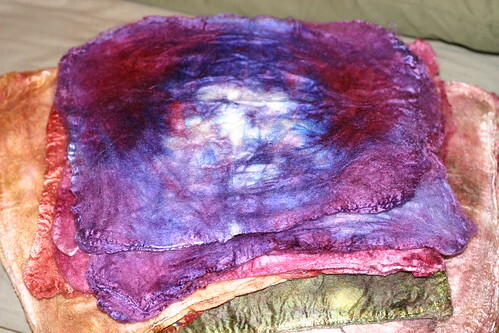 I tried to photograph the separation of one hankie from the stack, but it actually turned out to be two! So that’s something to beware of. 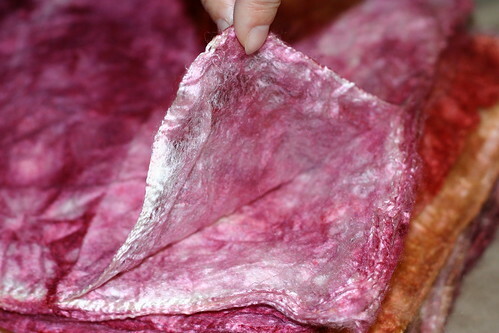 It’s helpful to look closely at the edges and make sure you really have a see-through piece of silk. You can’t see through this as well as the picture above. The next step was poking a hole through it and pulling it into a circle. My mom modeled these for me. 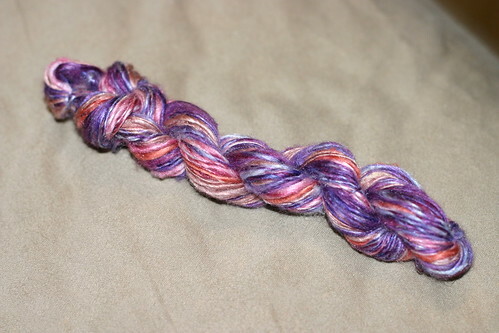 Then we stretched it out some more..
Until it was about the thickness I wanted to spin. Then I broke the circle and started spinning from one end. 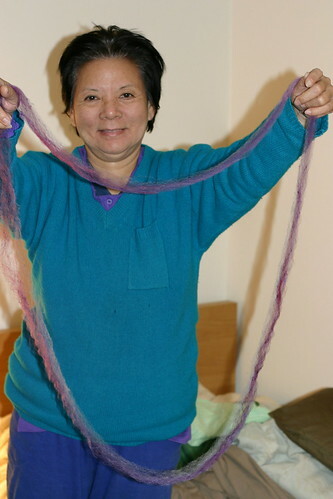 I found that spinning silk was quite an adjustment from spinning wool. 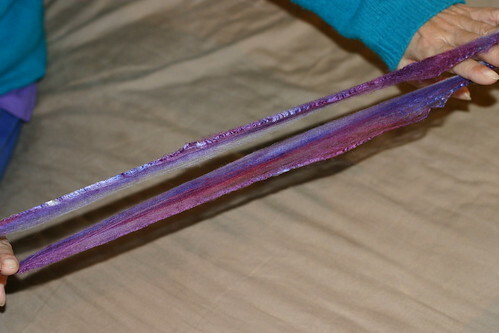 Because of the long, sticky fibers, I had to keep my hands very far apart while drafting, and it was still tough to pull the fibers out. I found it easier to predraft as fine and even as possible, and just avoid having to do much drafting while spinning. After about 8 hankies, this is what we had. I let my mom pick the colors. It’s a single ply, thick/thin with some nubbies, but still nice and shiny. It’s a little late right now but tomorrow I’ll figure out if it needs any finishing. Maybe not, since it looks quite knittable already! Thank you again – so glad you like it. Now for those hankies – I’ve already gone to Sakina Needles to check them out. They’re gorgeous and so much fun to spin. Imagine, there’s none in my stash right now – may have to remedy that! Awesome. 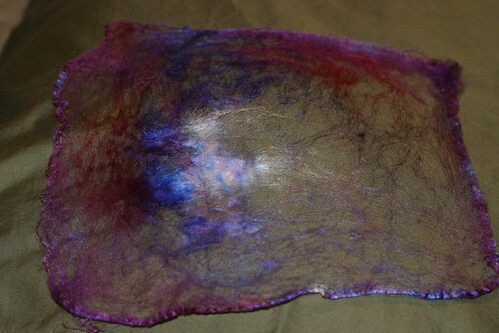 My silk hankies look like crap when I tried spinning them. I just can’t stand so many nubbies. You’ve given me the inspiration to try again, but not until I buy a very good hand moisturizer. I love your lace yarn too!